All you need to know about the 'quality' of some fans who root for The Bronx Embalmers was summed up in one moronic act last night. As Red Sox closer Craig Kimbrel was leaving the bullpen to enter the game in the bottom of the ninth inning, some brainless cretin threw a loaded beer can his way—just missing the player by a couple of feet. Major League Baseball Commissioner Rob Manfred needs to investigate this incident—and charge whoever can be identified as the culprit via video footage (of which there is plenty at The Concrete Bunker On 161st Street). This cowardly act of violence comes just a week after another 'Rhodes Scholar' Yankee fan dumped his beer on an Oakland A's fan at the Wild Card tilt. How many more examples do we need to confirm the fact that many Yankee fans (not all) are nothing more than boorish hoodlums. 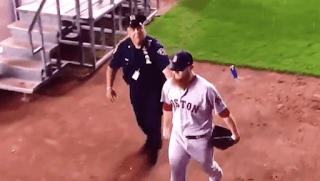 Granted, we have had our share of 'a-hole' Red Sox fans over the years who have harassed opposing fans at Fenway—but that was the exception rather than the rule—and almost never happens any more under the new NOG regime (give them credit for that). You can view a video of this heinous act HERE.